This Warm Freekeh Salad with Citrus Dressing is just the thing to keep us healthy by adding vitamins and nutrients to our meals! 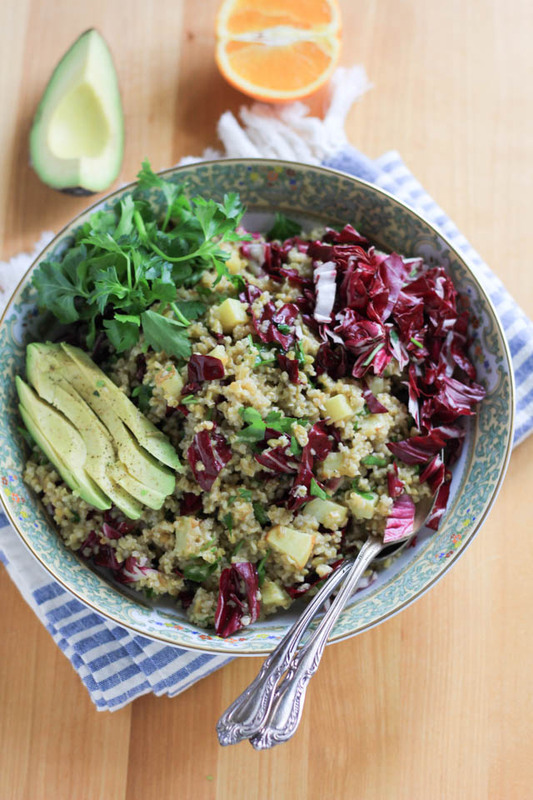 This is full of protein from an ancient whole grain and beautiful colorful vegetables! Freekeh is one of those things you may or may not have heard of or even tasted! It’s a nutty beautiful grain that cooks super fast and is full of protein to keep us full and healthy forever. Ok, I’m not sure about forever, but at least for the meantime while we eat this gorgeous warm Winter salad. I’ve been thinking on things a bit and making my best effort to meal plan in my own way. I always make food to have leftovers so that when I look in the fridge for lunch or need a quick dinner, there is something there to make that good choice. It tastes so good nice and warm right off the stove, cold, or room temperature. It was this or a sandwich. I do love my sandwiches, I always have. This is the perfect traveling salad, and super healthy weeknight meal. 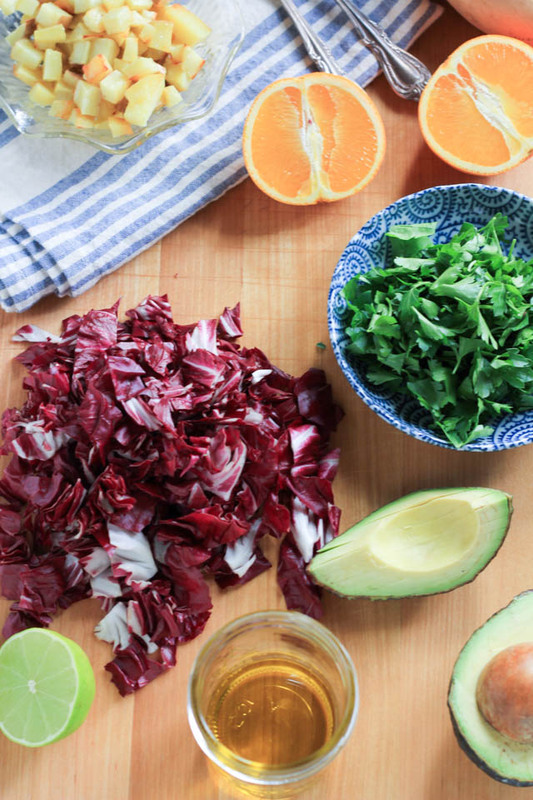 It’s colorful with greens, radicchio, sweetpotatoes, avocados, and a glorious vitamin C filled dressing. Making this Warm Freekeh Salad with Citrus Dressing for an easy weeknight meal is just the thing for this cold winter weather. Make a little extra for easy packable lunches! Cook freekeh according to package. While freekeh cooks, place sweetpotato on a parchment lined baking sheet, drizzle with 1 teaspoon olive oil and sprinkle with 1/4 teaspoon salt. Place in oven for 15 minutes or until tender. Once freekeh is cooked, place in a large bowl, add radicchio, sweetpotato, and parsley, toss to combine. Place olive oil, citrus, honey, salt, and chipotle in a jar fitted with tight fitting lid, shake vigorously for 30 seconds to combine. Add to freekeh, toss to combine. Serve warm with sliced avocado. Store leftovers in airtight container. Serve leftovers slightly warmed, or cold. This looks amazing! So filling, bright and full of flavor! Warm salads are my saving grace in winter when it’s so tough to eat a cold salad. That citrus dressing sounds so bright and delightful! Warm salads are the best right?!!!!! Thank you! I’ve never heard of Freekeh, but I love most grains, so am sure I’d love it! 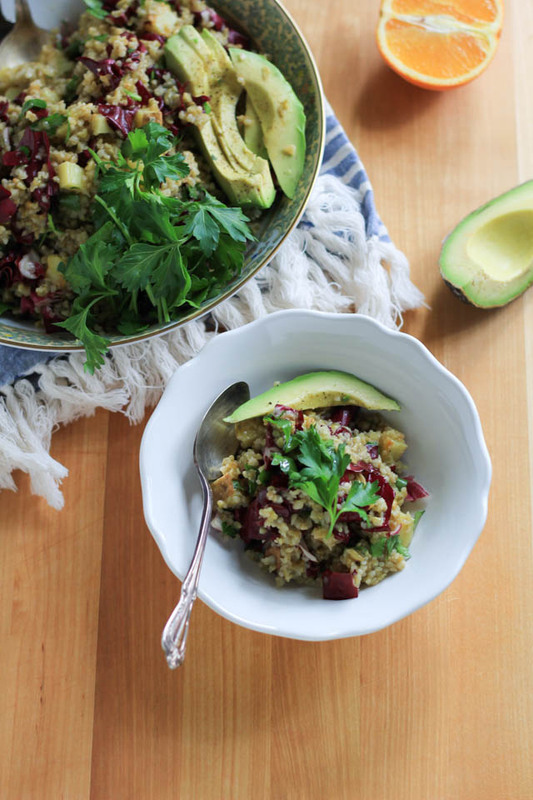 This salad is gorgeous, I need to track down some Freekeh!! Please do!!!! It is amazing. Thank you! I’ve never been big on small grains, but that salad is so gorgeous, I might just have to change my mind. It looks amazing. This grain has change the minds of many non grain lovers! Totally give it a try, it is a mild flavor grain with superfood nutrients. I haven’t had freekeh in years, in fact I had totally forgotten about it until now. I had it for the first time when I was doing a study abroad in Israel. Thanks for reminding me and I’ll definitely need to try your salad – it looks and sounds delicious! I am so happy I reminded you! I love love it so much. I make it for breakfast too. Thnak you! Mmmmmmmm … totally loving this! I really adore working with freekeh – so much nutrition, and such an underused grain! Truly great idea to go the “warm” salad route – that just feels so much heartier, especially on chilly days! Really excited to pin this gorgeous recipe! Ok I need to get my hands on some freekeh so I can finally try it!! Not only have I heard of freekeh, but I’ve made it and eaten it! Your salad sounds great! I eat something similar to this almost every night, but I never thought of putting them all together in a salad! I love the dressing too!